I might be slightly biased (as Sydney, Australia is where we call home), but I believe Australia is an absolutely fascinating place. We have amazing animals, stunning native flora, some pretty cool buildings and landmarks, all wrapped up in a quirky larrikan culture. 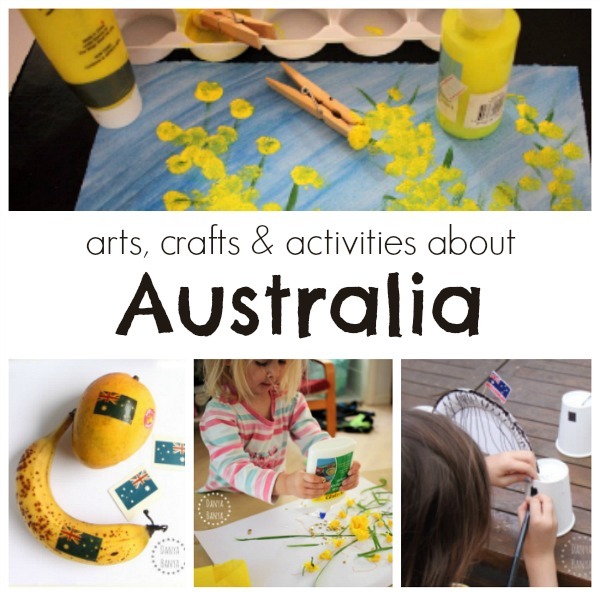 You’ll find below some of our Australian art, craft, recipe and activity ideas. I’ve also included a couple of our ideas that use particularly Aussie materials, like gumnuts and magpie feathers. We’ve found activities like this are a great hands-on way for our kids to learn about this country of ours. Make an Aboriginal Flag out of Lego. From A Moment in Our World. And here’s an Australian flag idea using Hema (fusing) beads. By Ideas 4 Kids. Make a blue ringed octopus from a tp roll. From Laughing Kids Learn. Make some cool boab tree mosiac pictures, from A Moment in Our World. I adore this jacaranda tree art from Be A Fun Mum. Love this torn paper collage of Uluru. From Kid World Citizen. Adventures of Adam has a cool Sydney Harbour tuff spot idea. 40 Favourite Picture Books by Australian Authors, as recommended by Childhood 101. The ABCS of Australian Animals is an interactive kids yoga book by Giselle Shardlow. Here’s a review from For This Season. Witness some kitchen chemical reactions with Go Science Girls’ easy Anzac biscuit recipe. Laughing Kids Learn has an Aussie damper bread recipe. Go Science Girls also has a homemade violet crumble recipe that is part science, part delicious! Visit the Australian Museum, next to Sydney’s Hyde Park. In addition to their stellar natural history exhibits, they also have a large anthropological collection focusing on indigenous Australian artifacts. Sydney Aquarium at Darling Harbour features a huge variety of Australian marine and fresh water aquatic creatures from various Australian water habitats, including the world’s largest Great Barrier Reef display, outside of the reef itself, of course! There are lots of sharks, sting rays, dugongs (yes dugongs! ), and much more..
Manly Sealife Sanctuary is a smaller, but more manageable aquarium for those with little kids. It focus specifically on the sea life found in Sydneys’ harbour and beaches, including (adorable!) little penguins. Plus there’s a lovely beach just outside for sand play afterwards. If you’re ever in far north Queensland, I highly recommend a visit to Wildlife Habitat Port Douglas. It’s has four distinct exhibits, each focusing on one of North Queenslands natural environments: the woodlands, wetlands, savannah and rainforest. Most of the exhibits are walk through – so you are in amongst the animals! Tickets are valid for several days, so we usually visit a couple of times per trip. Call ahead to check when the crocodile feeding is on. And don’t forget to purchase a small bag of pellet food, so you can hand-feed the magpie geese, emus, kangaroos and wallabies. Do you have any other Aussie activity suggestions or recommendations? I’d love to hear them! 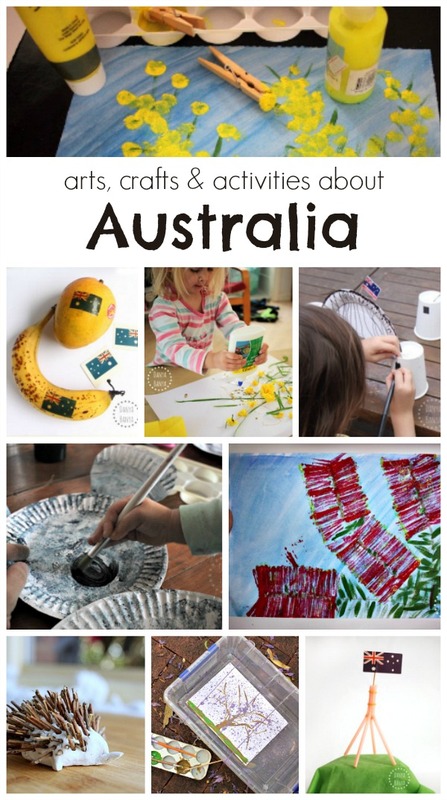 You can find all the above posts (and more) on our Australia for Kids Pinterest board.